A Vegan Guide To Stockholm — . While Stockholm can't compete with vegan hubs like NYC, Toronto, Portland, or Glasgow is does offer up an admirable share of vegan grub. You'll find tons of vegan products at every grocery store, making life easy for those who want to cook their own meals. As for restaurants, Stockholm has you covered. From hearty buffets to fancy pizza, Stockholm has all the vegan basics one would ever need. The best part? You can walk to all of them from the central station without too much trouble. This means you can stuff your face, walk it off, and repeat. So, without further ado I bring you my vegan guide to Stockholm! While O'Mamma Mia doesn't compare to the best pizza I've had (that award goes to either Apiecalypse Now in Toronto or Screamer's in NYC) this was a pretty solid offering for Sweden. 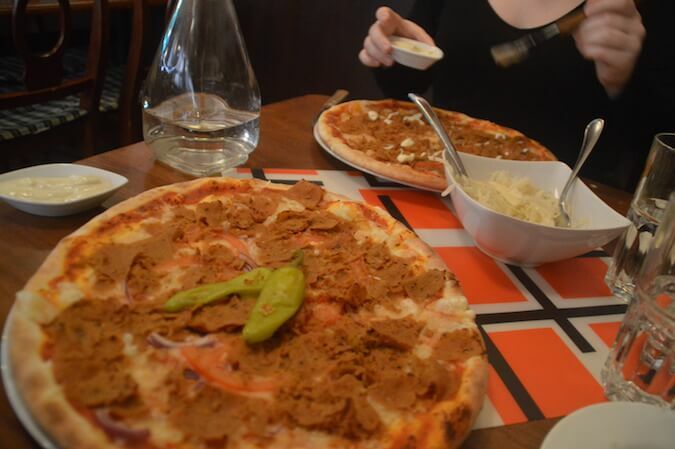 In complete honesty, until now I've never had great vegan pizza in Sweden — even after over two years of living there. Fortunately, that has finally changed. Hermitage offers a simple, hearty, healthy buffet. For 120 SEK during lunch (and 130 SEK for dinner), you get an all-you-can-eat smorgasbord of vegan eats. During my two visits I ate some amazing curried pumpkin soup, delicious salads, tagines, homemade falafel and hummus, and fresh baked bread. This is a definite must. I read that Lao Wei served up the best Chinese food folks had ever had, so I had to give it a go. Their menu is 100% vegan and quite extensive, albeit a bit repetitive. While our meals were delicious they weren't anything mind blowing. While I would definitely go back for some additional “research,” I can't quite give this the "Best Vegan Chinese Food" award. This is an organic bakery that has a TON of vegan baked goods. It was my daily breakfast stop on my most recent visit, chiefly because they have AMAZING vegan cinnamon buns. Their carrot bread was also spot on. I must confess, Herman's was a bit of a bust. Christine and I went there for Valentine's Day and we were not impressed by the service. I'm hoping their regular service is less chaotic, which is why I'm listing them here. I will definitely give them a second chance next time I'm in the city and I encourage you to give them a whirl (just let me know how it goes!). I went to this place on a whim after realizing a friend from France happened to be in Stockholm. It was recommended to Christine and I by a colleague of hers, so we decided to give it a go. We were not disappointed. It's definitely a popular venue, catering to the hipster crowd. It was packed by 6pm — which apparently is the norm every night of the week. If you're looking for good vegan grub and drinks, this is your go-to spot. They make a mean pizza, arguably the best in Sweden. This place has a bit of a hippy vibe, so if that's your thing then by all means check it out. It's very much in the same vein as Herman's and Hermitage, a sort of home-cooked buffet type of place. The location I went to had a light therapy room, which was neat (but also kind of bright and off putting). While the options here are limited, the food is good and the staff is friendly, so I wanted to give it a mention. I'll likely give it a second chance next time I'm in the city, if only out of curiosity. If you're desperate OR on a super budget, Both McDonald's and Max have vegan burgers in Sweden. While McDonald's only has one vegan burger — the McVegan — Max has a few different options, including come "chicken" nuggets that tasted so real I had to triple check with the staff that they were legit. While this is nothing fancy, in a pinch it will hold you over. Sweden is only of the only countries in the world where you can get the McVegan, so it's worth a try if only for the novelty. Stockholm may not be a world-class vegan hotspot, but it has potential. If you're visiting this beautiful city be sure to check out some of the vegan restaurants — I promise you wont be disappointed! And if you're looking for more vegan tips, check out this awesome post from vegan travellers! P.S. – Did you know I wrote a book? Check it out on Amazon! Sign up for exclusive content and sassy ramblings!